Navigating the Logan Square circle as a pedestrian can be treacherous. There are a number of dangerous intersections wherein drivers often fail yield the right of way to pedestrians. While it may be appropriate to blame drivers for making dangerous decisions, poor street design often contributes to, if not causes, pedestrian hazards. Below is a comparison of the three signal-less crosswalks that surround the Logan Square circle. Comparing the characteristics of these crosswalks offers a lesson in street design as it pertains to pedestrian safety. The photograph faces southwest. Ahead, there is a stoplight where Milwaukee Ave. begins to cut through the circle. Eastbound drivers in the circle wait for the signal to change and then accelerate across Milwaukee, around the curve, through the crosswalk, and onto the center section of four-lane Logan Boulevard. Almost nobody stops for pedestrians here. Notice the diagonal angle of the crosswalk, requiring pedestrians to cover more distance than would be necessary if it were perpendicular to the curb. Also problematic is its placement immediately after a corner. The photograph faces north. 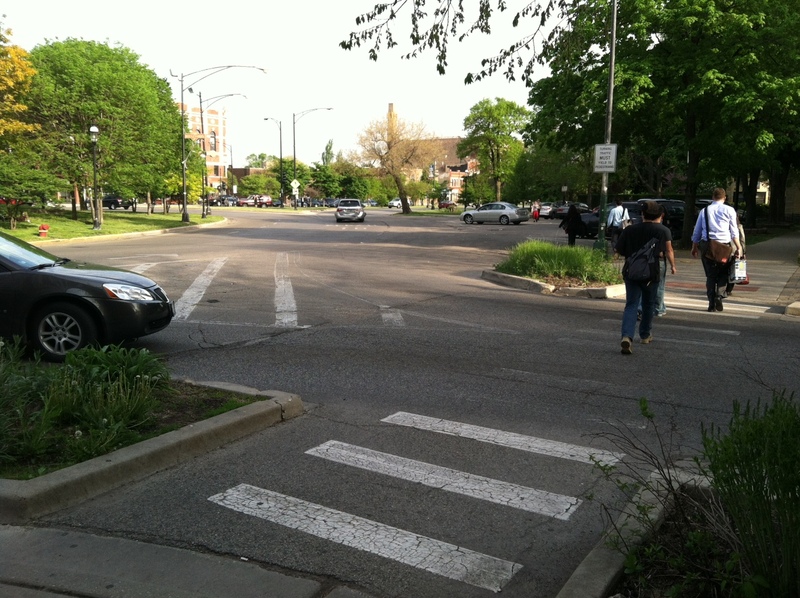 Drivers heading south out of the circle navigate a confusing curve before heading through this crosswalk and onto four-lane Kedzie Boulevard. Traffic moves pretty quickly through this narrow two-lane stretch, so pedestrians usually wait for a gap. This crosswalk has some positive characteristics. The large median (partially visible on the right) allows pedestrians to cross southbound and northbound lanes separately. Also, drivers seem to be a little short on space. There does not seem to be quite enough space for two lanes of traffic, and that can have a calming effect. Still, drivers rarely yield to pedestrians here. The photograph faces southeast. 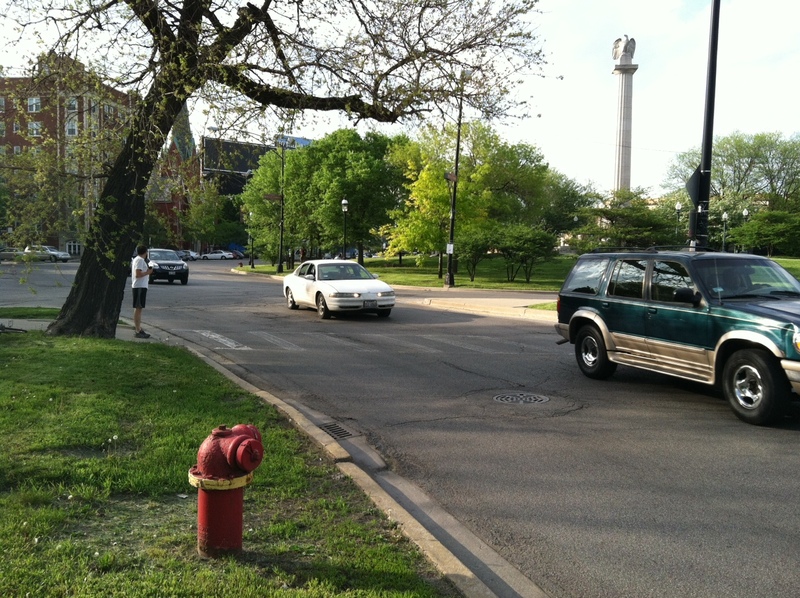 Drivers leaving the circle turn west on to Wrightwood (from left to right in the photograph above). Eastbound vehicles have a stop sign to obey before entering the circle (from right to left in the photograph above). Notice the curb extensions that shorten the distance across the street for pedestrians, and also shrink the space vehicles can travel through. Another difference here is that Wrightwood is a two-lane street, whereas Kedzie and Logan have four lanes. Drivers consistently yield to pedestrians at this crosswalk. Pedestrians confidently cross with little hesitation. 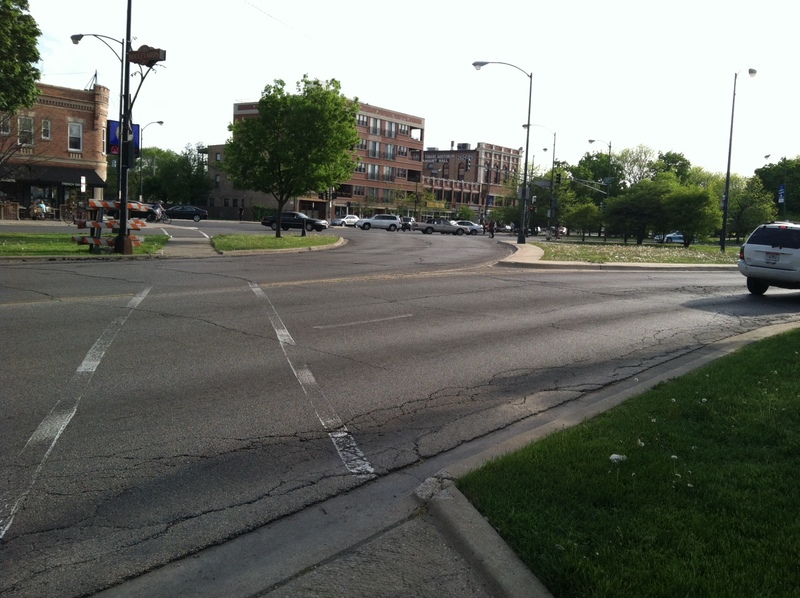 Why do so many drivers yield at Wrightwood, but so few at Kedzie and Logan? What is the most important characteristic of the Wrightwood intersection? Perhaps it is the curb extensions. Curb extensions have been shown to have a calming effect on traffic. Perhaps it is the larger number of pedestrians who use this crosswalk, many of whom are coming from the nearby train station. Or maybe the stop sign for eastbound traffic leads people to believe the right-of-way belongs to pedestrians, when in fact state law requires drivers to stop for pedestrians in all crosswalks. Or it could be Wrightwood’s two lanes compared to four-lane Kedzie and Logan. Most likely, a combination of these characteristics and others accounts for a more friendly pedestrian intersection at Wrightwood. Fortunately, plans are being developed for a major overhaul to the Logan Square Circle. We are excited and quite optimistic that the designs will include significant considerations for pedestrian safety.